In October 2011 I re-read a childhood favorite of mine. I waxed rhapsodic about it here. In June 2014 I blogged about how I found that book while I was picking up clothes at my local dry cleaners. This was no small deal. A book long out of print, almost impossible to find online and there it suddenly was in a pile of free books at my dry cleaners. And on top of that, it was actually the same exact copy that I had checked out in 2011 from my local library. It had been withdrawn from the collection. Probably when I returned it. It probably never made back onto the shelf. The book was just meant to be mine. Flash forward to the spring of this year when Simon of Stuck In A Book was visiting DC. We trekked out to suburban Maryland to comb through a used bookstore or two and ended up at Second Story Books‘ warehouse store in Rockville. In that warehouse store they have something called ‘The Annex’ which is a very large space crammed full of dusty old books in no order whatsoever. And I mean no order. A 1950s anatomy book next to a Pat Buchanan political screed next to a Campbell Soup cookbook. In many places the books were on the shelves three-deep. Knowing that I didn’t have hours and hours to spend in The Annex I almost skipped it entirely. But since I wasn’t looking for anything in particular I decided I would choose just one shelf section and see what I could find. Much to my surprise I started finding some things that I thought I should take home with me. I was haphazardly pulling out some books to get a look at what was in the third row back and something familiar-looking caught my eye. 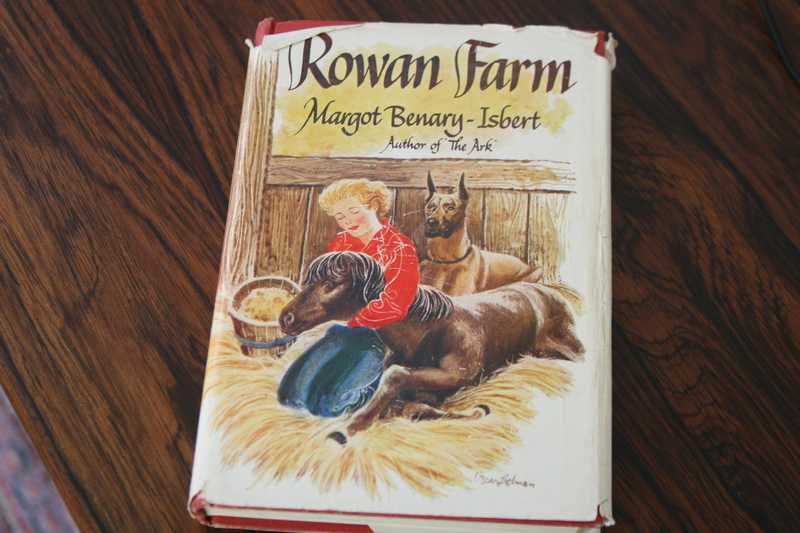 Rowan Farm, a sequel to The Ark by Margot Benary-Isbert. Yes, my friends, a sequel to one of my favorite childhood books. A sequel I had no idea existed. A very hard to find sequel to a very hard to find kid’s book published in the 1950s. And for about 3 bucks. Could this really be true? Yes it could and it was. I know with little doubt that the finding of these two books will remain the great book finds of my life. Not because they are necessarily my favorite books of all time, but the way in which they found me. All the particles in the Universe conspired to bring these two objects into my possession. Just when they had probably given up hope. Each just an inch or two away from being pulped and returned to the earth. Generations of kids wanting to read about other kids milking pet goats and making pretty curtains for the old rail car they were living in, will never know they want to read about goats and curtains. Now I need to spend the rest of my life figuring out how to pass them on to appreciative stewards. They’ve come too far to be lost again. Next Article I. Love. This. Book. Great find! I loved both these books when I was a kid, although I’m sure there are parts I didn’t quite understand about the aftermath of World War II. Terrific story! Enjoy your treasures. Oh that is exciting! Do you know that I’ve been hunting for a copy of The Ark ever since that Oct ’11 post? I haven’t found it yet, but I still look. I started out hoping to find to send to you, but then you found it. I kept looking with the excuse that my kids would probably like it. Now I just hunt for the sake of the hunt. 😊 In May ’12 I came across another of her books titled Under a Changing Moon in a homeschool catalog. I immediately ordered it b/c of your enthusiasm about The Ark, but I haven’t read it yet b/c it *isn’t* The Ark. I love that you found the sequel AND that it appears to be a matching edition. I’m filled once again that I will find it… So glad for you! Okay. Bad phone. I’m filled once again *with hope* that I will find it. What a great find, and a great story. I immediately checked WorldCat and requested a copy of The Ark from ILL. I love this story! I try to explain to my boyfriend that I can’t just order my old copies of Wuthering Heights online, they have to find me. Finds like this are the bibliophile’s true delight! I’m very pleased that I could have been there when it happened. A meant-to – be moment. The equivalent for me would be the books by Eleanor Estes, like Pinky Pie and others. I still get most of the books I read at the library where I grew up. They still had those same well-worn, soft paged copies that I read as a kid. Unfortunately, my boys didn’t think much of these “girl books” that were so dear to me. I would read a worn library book over a new book any day, I might add. I love this post, especially the part about how these books were just meant to find you. I hope you find the right steward for them. 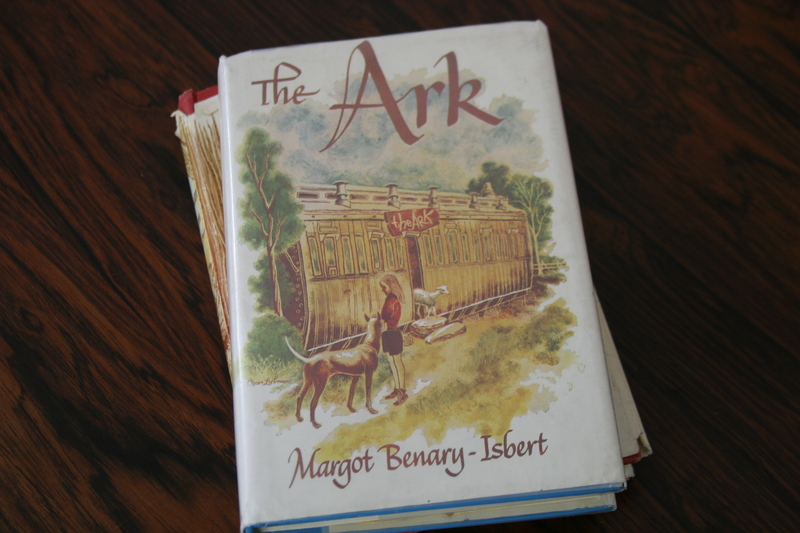 I did get The Ark via Inter-Library Loan, I’ve just finished it and LOVED it. Thank you so much for your post. What a lovely book. I loved these as a child but my absolute favorite Margot Benary Isbert is Blue Mystery, partly because of the amazing illustrations. And because it has an awesome dog (Great Dane, of course!). So fun to hear from someone who knows these books. For some reason I’ve never thought to look at what else she published. May I ask what decade you first encountered them? 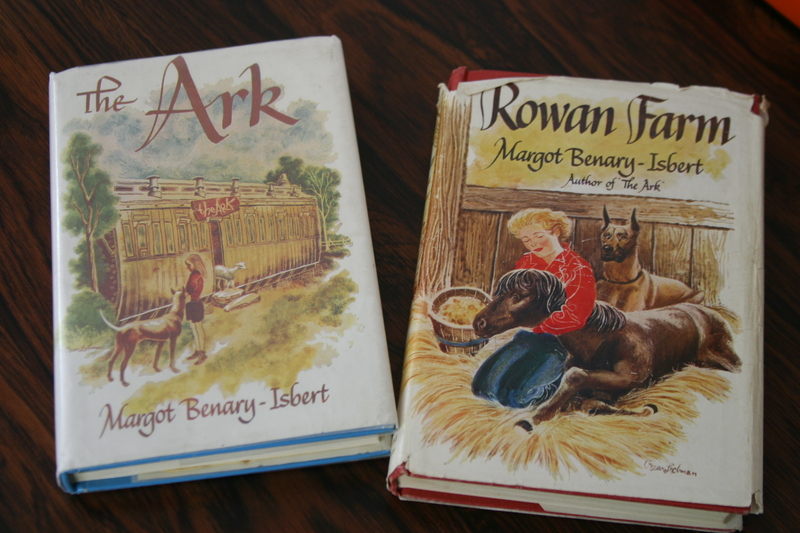 We (my older sisters) had paperbacks of The Ark and Rowan Farm in their bookshelves when I encountered them as a child in the late 60 to early 70s I suppose (I was born in 62). Then I got a paperback of Blue Mystery, maybe as a gift from one of the sisters around the same time, so it always felt like “my” book. I just checked and it was published in 1957. These two books were among my favorites as a child. . .There is a third book to this series. Well, not really a “third” book. . .but some of the characters in the Ark and Rowan’s Farm show up in it. . .It’s called “The Long Way Home” by Margot Benary-Isbert. It’s more of a “boy” story if you can say that. . .The Protagonist is a boy. I don’t think its as difficult to find. I am an English teacher and every so often I keep looking around to see if I can come up with a classroom set of these books. . .or to see if they will ever be back in print. They are are simply that beloved by me. . .Your blog came up in my latest search. Congratulations on your find! These are gold. I found your blog when researching the book “Under A Changing Moon” by Benary-Isbert. I ordered it late one night on amazon and when I got it I couldn’t remember why I even ordered it. I think you might sympathize considering your love for books. I too have found books in odd places or hidden away as if they were waiting just for me. Living in Germany I lended these books which are called “Die Arche Noah”and “Der Ebereschenhof” in my language from our church library when I was about 14 years old. My grandmother had to flee her home whith 3 of her children when my mom was a girl of 10 just like the Lechows. And my mom was telling me stories very similar to what happened in the books about not being wanted as strangers and how they where holding together as a family and thanking god for every liddle good thing they had. I found so many of our families values in there and I was loving these books so much that I kept lending them again and again, so that in the end our priest offered me to keep them for good. That was more then 30 years ago and last christmas it came to happen that I found the 2 books in a box at my parents house and started reading them again being just as fascinated. For a very personal reason I was trying to find out if these books have ever been translated to english language and found out about Margot Benary- Isbert immigrating to the US and publishing them there as well. I was immediately trying to get them somehow ( it is really important to me to read them to an american family I am very close to in their own language) but I had to find out that it is almost impossible to get them. This makes me really sad for I would have loved them to help me passing values of my family to these american children which are in a similar situation as in the book even though the times may have changed. Maybe somebody here could help me getting then without spending a fortune (the condition doesn’t matter as long as they are readable) which I haven’t got. Or maybe even lend them out to be shipped within the states I would promise to send them back after reading pay the shipment and maybe a deposit. Abebooks.com has copies of The Ark in English starting at around $50. The have Rowan Farm as well. Alibris also has copies but they seem to be more expensive. Love this blog entry! I just finished reading the Ark today. I also found it at a used books bookstore and thought that the summary seemed interesting (plus I just love YA novels that have substance). I didn’t think that I would end up crying while reading the book. I searched online if there was a sequel…you know that feeling that you just can’t let go of the characters and their stories. Sadly, Rowan Farm is so hard to find now. If anyone here knows where I could get a copy please please let me know.